ITEX Corporation (OTCBB:ITEX), the largest trade exchange in the U.S., announced operating results for its first quarter ending October 31, 2002. The company generated net income of $122,000 compared to a net loss of $725,000 for the same period last year. It's the third consecutive quarter ITEX has shown profitability. Moreover, the restructuring of ITEX shows a bottom-line improvement of almost $3 million--a profit of $409,000 compared to a loss of $2,512,000 for the nine months preceding the initiation of the restructuring program. An international web site based on the best-selling Fodor's travel book, Orlando Like A Pro, is expected to provide, along with a video and DVD, information to many of Orlando's 43 million annual tourists with up-to-date information on theme parks and businesses in Central Florida. The web site, www.orlandolikeapro.com, is set to debut on January 1. Scott Whitmer's Orlando-based The Exchange, www.exchan.com, has an exclusive contract the first six months and will be offering the advertising on the site exclusively to IRTA members through the Universal Currency. Whitmer is a very busy man these days, having taken over as the president of the International Reciprocal Trade Association (IRTA). 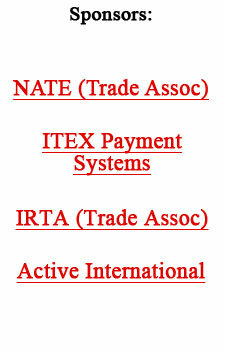 He reports that since the September Convention IRTA has held two Global Board meetings. Bob Bagga, who recently returned to the barter industry and was elected to IRTA's Global Board of Directors, had an interview on National Public Radio. Bagga was in his early twenties when he teamed up with Robin Maini to build one of the top exchanges in Toronto. It wasn't long ago when trade shows were viewed as de rigueur...an opportunity to make deals, catch up on old friendships, and have a good time in the process. Times are changing. Attendance numbers are falling, exhibitors discontent rises, and the organizers of many shows are faced with the necessity of evolving their events or facing the consequences. What's ahead? Attendees are looking for something different and impactful...the traditional learning model, an expert dispensing wisdom while attendees sit there to absorb the information like sponges, is bordering on the obsolete. It's more important now for people to retain information so they can use it in the future, and listening to something once isn't enough. There will be a shift toward interactive meetings--people will talk about what's important to them. People want pragmatic information they can use. Right away. And, more and more, the onus will be on every participant to contribute. Congratulations to Ilan Ben-Josef, BXI Orange County area director, for bringing together 169 vendors for another winning Trade Faire. One of the exhibitors--Jacqueline Sloboda of BuyersMartOnline.com--came all the way from Hoboken (NJ) for the BXI Trade Faire. Hayes was one of the independents who, in 1986, formed the California Reciprocal Trade Association--a loose affiliation of exchanges which desired to further their intertrade activity. Two months ago he married Isabelle, a lovely French woman who is a designer of beautiful jewelry. Hayes has followed his artistic talents opening a studio in a classic 1896 Victorian Church nestled in the redwoods of Mill Valley. For further information: www.TheArtSpirit.com. More coverage for publicly-traded International Monetary Systems (OTCBB:INLM)...they're being profiled by www.smallcapresources.com. SBC Southwestern Bell is bartering space on the covers of its phone directories. The U.S. aerospace Boeing Company, with $56 billion in annual sales, foresees senior management meeting with top officials in India. Objective: to develop a manufacturing base there. Boeing wants to work with India on a countertrade deal wherein Boeing would build manufacturing plants in India to produce spare parts, and then be paid for its plant investment in parts. Pfeffer contends that before you can manage a relationship, you first need to build it. And relationships are built less by fancy data mining than by what happens to customers when they actually make contact with your organization. Don't forget "the final 3 feet"--that distance between the customer and the associate--is the most crucial piece of real estate in customer relationships. It is in this space that the battle for survival and growth will be won. Correction: Last week's story on the online LET-System, a portal for individuals, cited the incorrect web site. The correct web site is: www.tauschmituns.de. Read the financial pages and one would think that acquiring stock in an IPO is the way to go. Actually, IPO gains have long been concentrated among a few winners. Since 1980, 1% of companies that have gone public have created 82% of long-term IPO gains, according to a recent Morgan Stanley study. Robert Coen, director of forecasting for Interpublic Group's Universal McCann, says ad spending in the U.S. will increase 5% to $249.3 billion in 2003. (Worldwide ad spending will jump 4.9% to $470 billion in 2003.) Coen's expectations are more bullish than those of ZenithOptimedia Group, as reported here last week. What's the hottest new amenity for hoteliers? According to those in the business, when renovation or additions take place today, a must is adding a spa. It's now rivaling golf for the upscale travelers. The fastest supercomputer is made by Japan's NEC Corp. and has been clocked at 36.5 teraflops, or trillions of floating-point operations, a second. Work is moving forward both in Japan as well as in the U.S. to build supercomputers that will reach 100 teraflops! Which, incidentally, is the estimated speed of the human brain! According to a survey by the National Association of Credit Management (NACM), one of every two businesses is tightening credit. Fund manager and investment adviser Marc Faber says that China's rapid development and industrialization will fuel stronger demand for a wide range of commodities. And that should benefit commodity-related companies in countries such as Indonesia, Malaysia, Thailand, New Zealand, Australia, and the Philippines. As China's economy grows and a significant portion of the population--perhaps 400 million people--becomes more prosperous, eating and spending habits will also change. Diets will see less starch and more protein, thus helping agriculture-based economies such as Indonesia, Malaysia, and Australia.